A new standout in concealed carry performance. 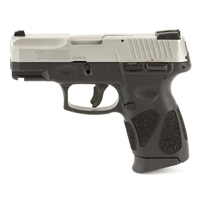 The Taurus G2c series was engineered specifically for everyday carry-and it delivers. With its streamlined, ergonomic design and rugged, compact polymer frame, you'll find the G2 series strikes the perfect balance between comfort and confidence in any situation. The Modular Back Strap design of the GLOCK 17 Gen4 allows one to easily customize its grip to add comfort, regardless of the shooter's hand size. The surface of the frame features the new Gen4 rough textured profile. Internally, the new GLOCK dual recoil spring assembly substantially reduces the wear and tear on the system. A reversible enlarged magazine catch, changeable at user level accommodates left and right-handed operators. 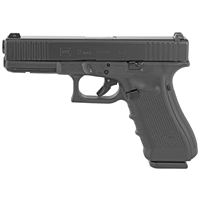 Introducing the Gen5 family which includes the G17 Gen5, G19 Gen5, G34 Gen5 MOS and G26 Gen5. GLOCK Gen5 pistols are the latest examples of GLOCK'S constant pursuit of perfection. Gen5 pistols feature over 20 design modifications from their Gen4 predecessors, including the GLOCK Marksman Barrel, nDLC finish, ambidextrous slide stop lever, the removal of finger grooves and a flared mag-well. These changes deliver improved accuracy, durability, performance, control, and flexibility whether you are on the range or in a situation where fractions of a second matter. As quick-targeting reflex sights have made their way onto defensive carry guns, GLOCK developed the G19 Gen4 in MOS configuration, making it easy to mount a reflex sight on the pistol’s slide without the need for a new slide or separate mounting system. Adding to that, the Modular back strap system makes it possible to instantly customize its grip to accommodate any hand size. The reversible magazine catch makes it ideal for left and right-handed shooters. In development for more than four years, the VP9 is Heckler & Koch’s latest handgun and the first striker fired HK since the renowned P7 series pistols were introduced in the 1980s. Experience gained by HK engineers with the recent P30 pistol had a direct influence on the design of the VP9, but the VP9 breaks new ground with its integration of a unique striker firing system with an enhanced HK “light pull” trigger. The net result is trigger quality unequaled in any production striker fired handgun. HK pioneered the first striker fired handguns, producing both the VP70 and P7 series, designs that impacted several models by HK competitors. But a superior trigger has eluded most striker fired pistol designs. The VP9 trigger surpasses those found on competitors. It has a short, light take-up with a solid, single action type break followed by a short positive reset.